We got home from California last night. I am experiencing jet lag, so sorry if I don’t make sense today. Ok, I guess it technically isn’t jet lag since the flight is less than two hours long and the time difference is only one hour. I am still feeling scattered and not ready to get back to the real world. So I am just going to blame jet lag. I hope that is ok with you. And don’t worry, we will post about our trip soon-stay tuned! I am ready to share this Baked Pumpkin French Toast recipe because it is incredibly delicious. I am a huge baked French toast fan. It is so easy and perfect for entertaining. We make Cinnamon Baked French Toast all year long, but this pumpkin version screams fall and will definitely take over our breakfast table during the chilly fall months. I love it! Baked French toast is awesome because you prepare it the night before…and it really doesn’t take much work. When you wake up, you pop the pan in the oven and wait for the oven to do all of the work. Not a bad deal, huh? I made this Baked Pumpkin French Toast on a Friday night so we could enjoy it on Saturday morning. The pumpkin flavor is magical! Pumpkin lovers are going to go crazy for this breakfast treat. The cinnamon streusel topping with a hint of nutmeg compliments the pumpkin and adds the perfect sweet ending. We had some leftover cinnamon syrup in the fridge from when I made Whole Wheat Apple Cinnamon Pancakes so I drizzled cinnamon syrup over our French toast. Oh yum! You can use maple syrup too, but I am telling you, that cinnamon syrup is liquid gold. Looking for more pumpkin recipes? Check out 50 Pumpkin Recipes for Fall! 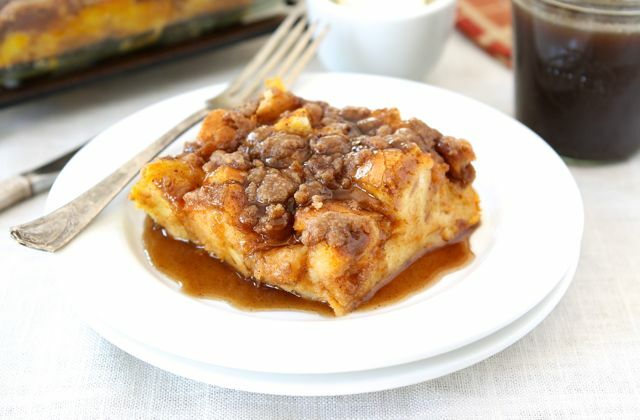 This easy Baked Pumpkin French Toast with cinnamon streusel topping is a wonderful breakfast treat during the fall months. In a large bowl, mix together eggs, milk, pumpkin puree, sugar, vanilla extract, cinnamon, and nutmeg. Pour evenly over bread. Cover pan with saran wrap and store in the refrigerator for several hours or overnight. In a separate bowl, mix together flour, brown sugar, cinnamon, nutmeg, and salt. Add butter pieces and cut into the dry mixture using a fork or your hands. Combine until the mixture resembles sand with a few pea sized chunks. Cover and store mixture in the refrigerator. Looks like you had an amazing time in Cali! You guys get to go on the best trips. Little man is going to be such a traveler. The french toast looks amazing. I do love a bake you can make the night before. Perfect for when you have guests (and a baby ;)). Oh my gosh! I love, love, love it!!! Your french toast looks out of this world!!!! I think I just about died – can NOT wait to make this!!! 😀 Thank you for sharing! great, now I want breakfast again. Those type of “do ahead” offerings are great for teenage gatherings as well. So… when that little sweet pea is old enough, your kitchen will be the “IT” place. Get ready. Now I don’t know what to make for Thanksgiving breakfast! This amazing recipe or your pumpkin cinnamon strudel pancakes. Sigh. Decisions, decisions. This looks so delicious! I love make ahead recipes … especially ones that look as good as this one!! this looks so good, I am experiencing drool right now! 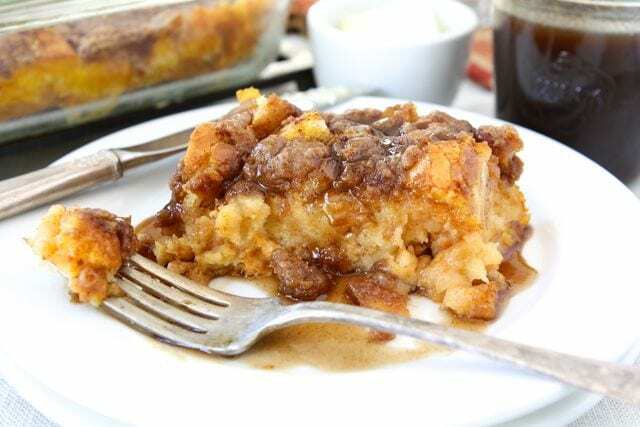 I adore overnight baked french toast, and a pumpkin version is just perfect. The streusel topping is brilliant too! Sounds wonderful! I do have a question though; is the French bread you use a baguette or the larger French/Italian bread? I use the larger French/Italian bread, not a crusty baguette. Enjoy! Gorgeous! I love the streusel topping! oh my word! you hit me in my very soft spot. 😉 yum! Things like these always remind me of Christmas morning because we always bake up something like this to eat after opening gifts. I just love that tradition! I looove baked french toast. Have you ever tried it with challah, it’s another great egg-ey bread that works great in a bake. wow that looks good! Made my stomach growl the second I saw the picture! Amazing looking French toast, Maria! I could have this for breakfast again and again this fall… I’d love to try it! Mmmm, that streusel topping is just calling my name!! Yes please! Love this idea! Now this is amazing! This would be the perfect breakfast for Thanksgiving! Thank you so much for sharing this recipe. It looks and sounds amazing. Making this for dinner, too. But really 2 tablespoons of vanilla? Seems like a lot, but I do love vanilla! What a tasty idea for an easy breakfast! When shall I come over for breakfast??? Yum! This looks fabulous and so easy to prepare too! I love baked french toasts too. It is really great to have in your arsenal for entertaining. Looks delish! I need to entertain more so I can make this without eating the whole pan myself! Looks amazing. This is at the top of my to do list! This looks amazing. It’s on my list to make! We’re having guests this weekend, and I’m absolutely making this! Just when I thought it couldn’t get any better. I’ve had a sudden craving for all things pumpkin and you are NOT helping. I’ve got the pumpkin strusel cake on my list for this weekend. I may have to push things up a bit. Ooh, this has definitely made my fall baking list! Yum! I HAVE to try this! 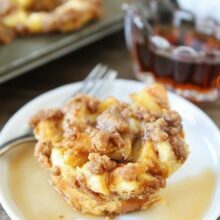 I have made a few bread puddings for brunch… some of them awesome, some of them ‘meh’ and this looks like an awesome one! Especially with the pumpkin twist for fall!! Holy heck. That is one drool-inducing recipe. 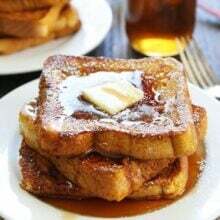 Pumpkin french toast is perfect for this weather and the season. And I love that it’s baked, so less time spent in the kitchen. Yay. Or Boo. I like eating french toast for breakfast. This will be an interesting fall version. 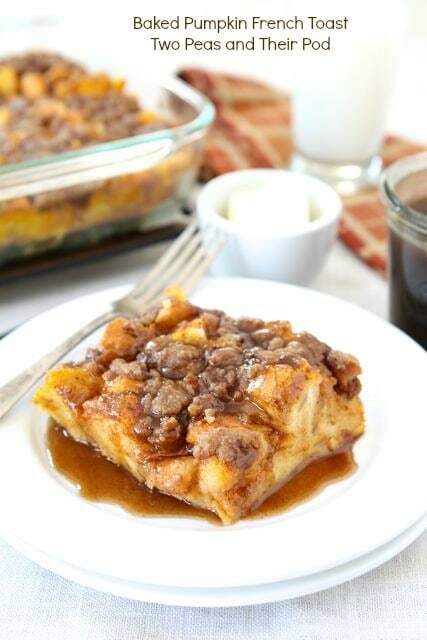 This pumpkin french toast looks amazing! I have some leftover pumpkin puree that I made that I was looking for something to do with, this just made the top of my list! Thank you for sharing this recipe! I love a good make-ahead breakfast! This one definitely looks like a winner. Yum, this looks so incredible! What a treat this would be when we have family over for the holidays! I made this for my family tonight. They said it was Divine. It was nice having it already made and being able to just put it in the oven. Glad you liked the French toast. We love breakfast for dinner! If you prefer sandwich bread for French toast you can try it. It might be a little more soggy than the French bread. Wow, making this on the weekend. I also love make ahead brunch dishes….so perfect for this time of year! Pingback: Happy Friday! | plays with food. Just took it out of the oven. Looks beautiful and my house has never smelled so good!! I’m sure it will be as delicious as it looks & smells!!! We loved the melty interior and crusty topping. Perfect brunch option! Thanks so much for providing the recipe. 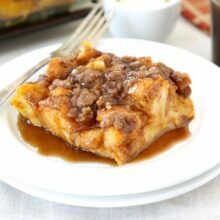 This baked pumpkin french toast is fantastic!! Made it for my family for breakfast this morning and it was a huge hit. I’m thinking that it will be on the menu Christmas morning – so easy to assemble the night before and then toss in the oven in the morning. Thanks for the great recipe! What an amazing fall breakfast! I made this today for a ladies’ brunch along with your recipe for cinnamon syrup. Everybody went crazy for it and wanted the recipe. I used fresh pumpkin puree, and it was delicious! A major bonus was its simplicity! I will definitely make this again. Oh, I made two batches, and only half of the syrup was needed. A little goes a long way! This is currently in the fridge soaking for tommrow morning , I am taking it for breakfast for my coworkers 😀 instead of using milk i used pumpkin spice eggnog. What can i say? I love pumpkin!!!! DD stopped eaitng all fruit and veggies so I survived by giving her dried fruit leather which she would eat. When it started being a problem with her teeth; she was about 6. At that point I started insisting on a few peas, some salad, a few slices of apple etc.At 13 she eats broccoli, cauliflower (smothered in hot sauce) peas,corn and more, applesauce, peaches and all berries. I believe in the idea that you have to offer a food more than 5 times (up to 20) to get it to stick. I see too many sites where a child will only eat chicken nuggest (gfcf) and fries to take chances. I feel if I hadn’t pushed; she would still have a fairly restricted diet. My goal is to have her naturally choose these foods for when she moves out and I’m not around to shop for her. I just made this for Christmas breakfast and everyone loved it. I made two pans — one with regular bread and one with gluten free bread, then I just substituted gf all-purpose flour in the topping. Both turned out great! I combined this recipe with the eggnog recipe and it turned out delicious… Will definitely make this again. Maria, I made this for Christmas morning breakfast and it was delicious! Very quick and easy to put together. Thanks for sharing! Awesome! Just made this and its a keeper. I used whole grain organic sprouted spelt bread that I had made and substituted maple syrup for the sugar. Also -maple sugar in the topping rather than brown. I took out 1/2 C milk (used almond milk) to make up for the liquid in the syrup. I didn’t realize that the recipe called for 1C of pumpkin and accidently used a whole 15oz can. I did cook it for the full 55 minutes. It was AMAZING and didn’t need any additional syrup when served. Is it possible to use canned Libby pumpkin? I don’t have any access to pumpkin purée. Maybe add some milk to it? Please let me know I would like to use this recipe very soon! Thank you. It looks incredible! Is the bread not soggy with so much milk? When I make just normal french toast I only add about 2 T for 3 eggs or the bread is just soggy so this seems like a lot. I prepared this last night and didn’t bake it this morning. When I bake this tonight and eat the left over tomorrow, will it still be good? How do you think it would do with challah instead of french bread? Challah would be so good! Pingback: 35+ Pumpkin Dessert Recipes Round Up - Shari Blogs...all things sweet & delicious! I want to make this for breakfast and I am wondering if anyone has had success with challah in this recipe. Pingback: Pumpkin Pistachio Squares or Barfi ? | Foods I love! Foods I experiment with! Just made this. It was amazing! We actually ate it as a dessert with vanilla ice cream on top. Thanks! Why French Bread? Why Can’t I Just Use Reagular Whole Grain Bread? This looks so yummy! I plan to make this tonight for Christmas morning. Would this work with Brioche? Can’t wait to show this dish off to our house guests this weekend! I have just one question, a load of French bread is sometimes different sizes. Can you guesstimate the amount of cups? Thanks tons! Sure hope she’s still reading comments. I’m doing a breakfast swap…will this freeze good to bake at a later date? I have never tried freezing it. Sorry! Let me know if you try it! 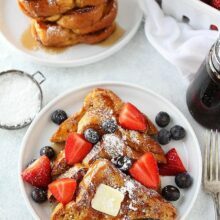 I love french toast and would love to try this recipe. Can you tell me, however, is the bread consistency supposed to be soggy or is it crispy? Just came across this and made it! AMAZING!! My husband, daughter and myself were blown away! In the words of my hubby..this is definetly a keeper!! This is definitely a “keeper”! My family and I loved it’s flavor- not too sweet and not too “pumpkin-y”. I have made eggnog French toast casseroles, but they are always drier than this. The pumpkin really kept it moist and flavorful. My grocery store doesn’t sell long loaves of French bread, so I used their round county-style French loaf. It was perfect. Thank you for giving us a great recipe to keep in our family collection! my topping does not come out as a crumble. Anyone else experience this? It’s more like a paste. I thought to much butter maybe. Pam…just made this for tomorrow morning and my topping turned out gte same. I was just reading through the comments to see if anyone else had the same results. Can’t wait to bake this! The kiddos are excited! Made this last night for today’s breakfast – wow, this was excellent! This was amazing! I thought it might be too sweet with 3/4 cup sugar but it was just right. Sometimes french toast casseroles are too sweet but this was perfect. Love the topping and the pumpkin flavor was so good. This is a keeper for holiday breakfasts! Made this as written, except I added 8 oz. of cream cheese cubes before adding the crumb topping. Absolutely delicious and will definitely make again. Didn’t need the syrup for sweetness or moisture, though I’m sure it would only add to the decadence. Highly recommend! I see these comments are from awhile ago, so I’m hoping I can still get a reply. I have made this several times exactly to the recipe and it is great! i don’t want to be one of those reviewers that change the whole recipe and then give it a low rating so I have 2 questions. I hate having just a 1/2 c of pumpkin left. COUld you add the whole can of pumpkin but then what kind of other changes would you have to do? More eggs and/or milk? Also, could you put a measurement on the bread, like 6 cups of cubed bread for example? One “loaf” is so arbitrary, depending on the store. I love this recipe! It’s our “go to” brunch recipe when entertaining. Super simple and easy to make ahead of time. I made this yummy french toast Christmas day. Everyone loved it! It heats up great the next day.